Influencer marketing platform Matchmade has raised €4.25 million in a round of Series A funding. The round was led by Korea Investment Partners and it'll allow Matchmade to fund expansion into more countries. The company is also about to open a new head office in San Fransisco. Matchmade also welcomes Jordan 'Soma' Tayer as its new GM for North America. Tayer is a former Twitch employee and small streamer (pictured, right) and he'll be running Matchmade's new San Fran HQ. The platform has the power to analyse over 300m videos spanning across 3m YouTube channels, and those services will now expand to Twitch. Matchmade can also provide data for over 12m streams and 260k Twitch channels. 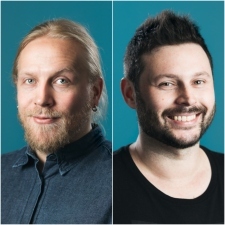 “The incredible 400% growth in campaign budgets by advertisers, is a testament to the growing importance of influencer marketing," said Matchmade CEO and founder Kupiainen (pictured, left). "This funding round allows us to double down on the development of the Matchmade platform, and most importantly in growing our team. Adding Twitch to the Matchmade platform means that we are better able to serve our customers and influencers alike by offering a broader data-driven approach to sponsored content.